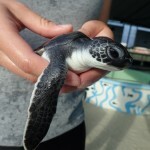 In December we saw the arrival of a green turtle hatchling, which was soon named Jonathan by our Marine Biologist, Ben. At two weeks old he was in very good shape and active. We finished our art piece, made from recycled bottle caps. The idea is to raise awareness about the impacts of plastic on the marine environment and to show potential ways of recycling. Hopefully what we have produced is thought-provoking and will inspire people to come up with some creative methods of recycling.